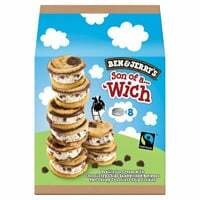 Right now Ben & Jerry's is giving away £2 coupon for free which you can use to claim a free pack of Ben & Jerry's Wich that is their delicious cookie ice cream sandwich. Just follow our link and get your free coupon now. This product is retailed at £3 in stores so it will only cost you £1 when you use your coupon. Click on “GET IT HERE” button and then get your free coupon from Ben & Jerry's.